Arrow graphics for PowerPoint presentations in various designs. 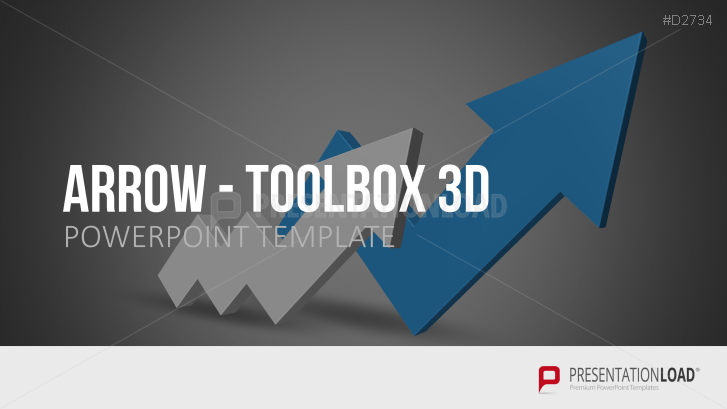 Three-dimensional arrow graphics, various arrow designs on over 150 slides and arrow toolbox included in Multiple Arrows 3D PowerPoint set. At times, it becomes necessary to connect more than one idea with a superordinate concept. To make ideas visible and understandable, arrows and arrow charts can be used to relate and connect thoughts and to contextualize subject matters. Diagrams serve to structure ideas and thoughts and visualize connections and relations with the help of illustrative graphics. Arrow graphics exemplify related thoughts and allow your audience to better comprehend the essence of your lecture. The PowerPoint template set includes various arrow graphics as well as a big collection of arrow elements to create individual charts and illustrations. Exemplify heavy content with allegorical samples.